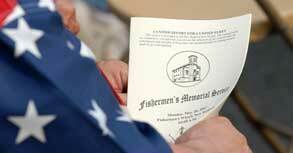 Please join us for our annual Fishermen’s Memorial Service. 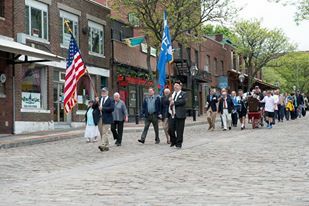 We will gather at Seamen’s Bethel at 9am, depart at 9:30 for a walking procession down to the waterfront. The service will begin at 10am at Pier 3, Fishermen’s Wharf. This event is open to the public and all are invited to attend. In the case of foul weather, the entire service will be held in the Seamen’s Bethel Chapel. In September 1950 the vessel Theresa A went missing at sea and never returned. On that boat was a Francis J L Martens. Do you have a copy of the obituary listing his family left behind? Or do you know how I can get more information on Mr. Martens. Thank you so much for any information you can provide me..
Hello and thank you for your inquiry. I double checked in our records and I didn’t find the Obituary, however, he is listed in our Fishermen’s Memorial Service booklet. The New Bedford Public Library on Willams St in the downtown area has all the Obituaries in their filing system and they would most likely have more info on him and the vessel. Please call us at 508-992-3295 if there is anything else I can help you with.